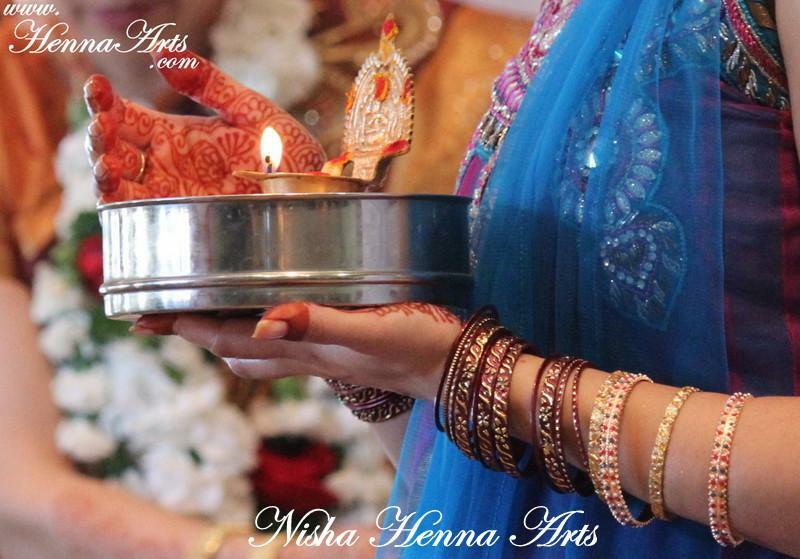 We offer convenient time for your karva chauth henna in Austin, before or on the day of festival. 'Karwa Chauth' - The fourth day of kartik month. Very special day of women in India and other part of world who observe this festival. Henna or Mehndi is essential part of the festival which symbolizes the love and connection between husband and wife. We offer conveniet time for you to get your henna done before the festival. Call/text us and we will be happy to keep the time for you. For a newly-wed woman, Karva Chauth is particularly special, as they get decked up in their bridal lehnga-choli. The things that symbolize and reflect the marital status of a woman, such as jewelry, bangles, henna, bindi, lehnga choli and many other traditional gifts are in high demand on this special occasion. Usually, women receive beautiful gifts from their husbands and relatives on this day, as a gesture of their love and care. According to the ancient Hindu texts, the will power of a married lady to change her husband's bad fortune into good is so strong that it can even change God's ultimate decision. So, the relationship of man and his lady are eternal and blessed. First of all, don't delay and call us to make appointment for your henna. In the morning while you have sargi or any foods, try and avoid very sugary (with too much sweet) and oily foods. The sweet foods tend to aggravate hunger later in the day, therefore, avoid those hunger pangs by avoiding too much sweet. Oily food will result in more thirst. Home made Paneer is a healthy option as it is high in protein and will therefore fill you up for longer. Almonds and walnuts are good too, as they make up your energy reserves for the day. These nutritious nuts are high in essential fats (linked to anti-ageing and lowering cholesterol) and are also high in protein, which will keep you filled for longer. Drink lot of water. If the water is warm, it gets absorbed faster as it matches ambient body temperature. Come to our home studio for experiencing the ambience and setup for a perfect henna application. We can also bring Bollywood, Arabic or Mediterranean setup to your event at home or at business. Ask us for colorful decorations and party rentals. © Henna Arts - All Rights Reserved. Website conceptualized, designed and maintained by Thousand Hits - get one yours.